Watching Dr Strangelove in a bar in Beijing last night was one of those very special evenings. The twists of satire and irony will stay with me for a long time. Some interesting looking music on over the next couple of days, too. 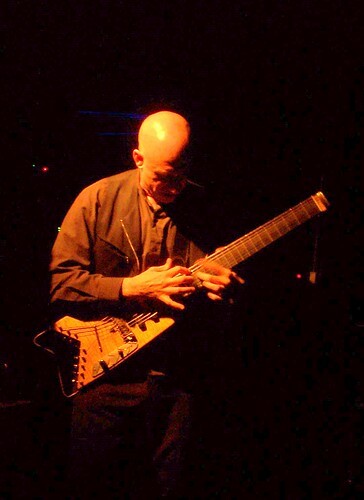 I saw Elliott Sharp at D22 a couple of months back and promised to write a review. It's been bugging me ever since because, to be honest, I still don't know what I thought. I enjoy experimental music on the whole, the creative electricity of it can be exciting and the dynamics of the musicians is always fascinating to watch. I spent most of the Elliott Sharp concert with a big grin on my face. I enjoyed it, without a doubt, but I don't know whether I was smiling because of the genius of it or the chaotic self-delusion. It was noise, there's no other way to describe it. It was disharmonies on guitar caused by random bits of metal grating against strings. It was flutes straight out of Star Wars warbling in different rhythms and different keys (there were no keys) with tuba accompaniment. It was expressions of deepest concentration making music that clashed in ways unimaginable before the evening. A few people walked out within the first minute. Many stayed and enjoyed it, but I'm not sure what they, or at least I enjoyed. It was, without a doubt fun, and perhaps that's enough. Maybe I just don't understand the depths of musicality which went into it. It took explanation from educated friends and a lot of listening to appreciate a live jazz concert, which I do now, hugely. I can see the dynamics of the musicians as the tune is juggled and manipulated and I love the journey you can be taken on if you follow where they're going. I don't know if I need to know more about where Elliott Sharp was taking us or if I just need some chemical additives to fully appreciate his music. I'd almost certainly see him again because, as I said, it was a lot of fun to listen to and watch. If anyone else is an aficionado of this sort of experimental music then please tell me what I should be listening for. If you think this is absolutely emperor's new clothes played loud, then I'd like to know your opinion, too. In a random aside I was highly amused to hear about the klezmer-metal fusion band: Black Shabbat. This I've gotta hear. (from Charmaine X, a creative, amusing Beijing blog I recently stumbled upon).